I was all excited about yesterday’s Brickyard 400. My man Tony was the defending champion and I was hoping for a repeat of last year’s performance. He was getting some nice air time this weekend from everyone–Trackside, QVC, and Race Day. In case you missed it Tony was on Trackside and Elliott wanted to declare him Mr. NASCAR. Then over on QVC’s “For Race Fans Only”, Tony was helping them promote and/or sell NASCAR merchandise. We bought two t-shirts (one Mark M. for Postman and the Tony shirt for me), plus a die-cast display case. You couldn’t beat it. We can pay it out in installments over 5 months as well as free shipping and handling. On Race Day, they showed Tony racing in the Spencer Junk Yard Race. Very funny stuff. Tony was having a HELL of a time. And of course Tony won. And did you notice the number on the side of his car??? #19…kind of funny—was he poking fun at Jeremy?? Perhaps Tony needs to get a Carl pinata and beat the HELL out of it. Of course I really hate NBC–they are so pro-HMS–yuck. Everything looked great, both Elliott and Tony were starting midpack, but I knew it wouldn’t take them long especially Tony to get to the front. Then it happened….Elliott went down in Turn 2 and ended up in the wall on Lap 3. IT WAS UGLY. Let’s just say I was yelling so many unsportsmanlike words at the TV. How much more can this man take this season I ask you? NBC interviewed him in the garage and like a gentleman accepted responsibility for his crash. You could see the disappointment in his eyes and his voice. What a year–last year on the pole to this year–43rd. Things look like they would pick up however, when Jeff G. thought he had a tire going down, however it turned out to be a broken bolt on his left sway bar. Jeff went a lap down. This pleased me somewhat, but it angered Postman. He had Jeff G. this week in his weekly driver contest. Throughout the race Jeff was able to get back on the lead lap thanks to some cuations and that damn lucky dog award. Speaking of HMS, I thought the NASCAR gods were on my side yesterday, when THAT DRIVER blows a left front tire. But somehow, someway THAT DRIVER comes out smelling like a rose. That’s all I have to say about that. Tony looked good yesterday. He started back in 32rd but quickly made his way through the field. There was little bobble with a lug nut on one of his pit stops, but we all know Tony won’t let a little lug nut get (i.e. Edwards) in the way of winning the Brickyard. I didn’t get to see them interview Tony on NBC because I was over at Speed watching Race Day. I had no idea Countdown to Green was going to run over Race Day. But apparently, Tony was asked about the incident at Pocono (once again), and he said, “he calls Carl Edwards the “Eddie Haskell of NASCAR.” Of course in NBC fashion they ask old Cousin Carl about Tony and I quote his words , “Tony’s just a moron. He never admits he’s wrong, and that’s a shame.” You know what Carl, you’re the moron. Tony is over Pocono. I am over Pocono. You know what I agree with Tony, you are just like Eddie Haskell. Sweet and all innocent sounding–golly gee pa in front of the media, but turn your back and BAM–a jerk. I will give you something to flip over. 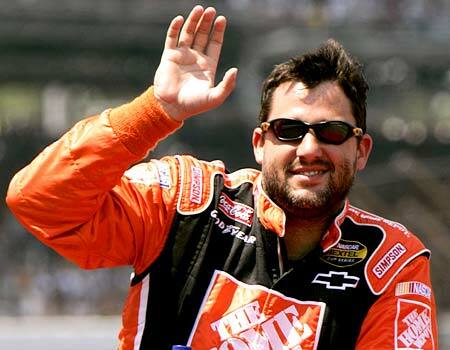 Oh by the way…that was Mr. Stewart’s orange #20 Home Depot car finishing in front of YOU! That’s right Tony finished 8th and he is now 9th in the standings and well…you are 14th. 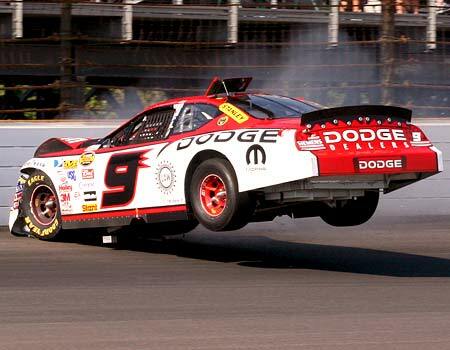 I was excited at the prospect of Jeff Burton winning the Brickyard yesterday. But as we all know and saw that wasn’t the case. Jeff finished 15th after a dominating day. I was hoping and praying and wishing for the NASCAR gods to take out THAT other home improvement car, but they did not heed my prays and wishes. I cheered for Junior. I cheered for Matt. There was even a late race crash, but it was too late. THAT DRIVER won. I gave up good study time to see this happen. I just wanted to cry. I did find it amusing tthat DUMBASS dropped the flag during his celebration. Tony wouldn’t have dropped the flag. And did you see the “flying objects”??? I guess there were some upset fans. Of course all NBC did was fall all over THAT DRIVER. The y talked about all the adversities THAT TEAM had gone through and blah, blah, blah. Where were the commercials then NBC??? Well, Kasey Kahne suffered a hard hit at the end of the race. I hope it wasn’t those crazy Kasey stalkers. You know how they drive. Hopefully Kasey has Allstate’s Accident Forgiveness. All in all Tony had a good day. He finished 8th and moved up one spot to 9th in the standings. Next week the boys are road racing at Watkins Glen. Unfortunately I will be doing my own kind of road racing on my way to Vegas for a much needed VACATION so I won’t get to see the race. 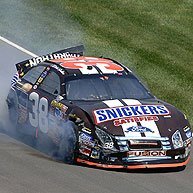 One more note…love those Little Debbie commercials with Ken Schrader. Very, very funny. I was so up and down during that race. First Esad’s wreck was terrible! Then I chuckled at JG and JJ’s issues and the jerks came back. UGH!!! And what is up with the JJ loving at the end? Kasey goes head into the wall and has to get himself out of the car? Oh well, Matt did come in 2nd and Tony should do great at the Glen next week! Hope you have a great time in Vegas!! And Schrader’s commercial was funny! Man, I was sad to see him wreck. I have to say that I admire him for not wrecking into Tony. I just hate that it caused him to lose his spot in the top 10.